Title: The great train robbery written by Scott Marble. Date Created/Published: Cinti ; N.Y. : Strobridge Lith. Co., c1896. Medium: 1 print (poster) : lithograph, color ; 74 x 50 cm. 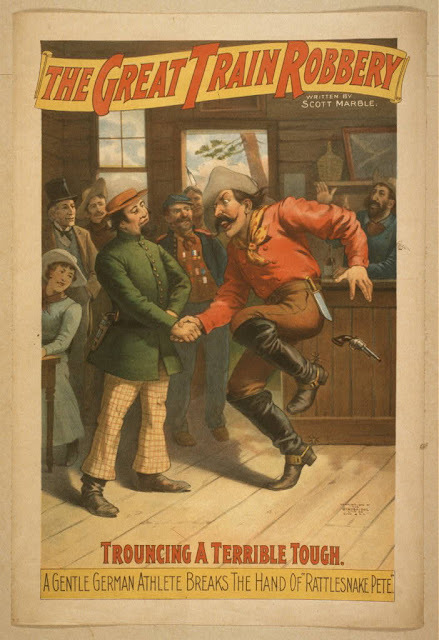 Created and "copyright 1896 by The Strobridge Lith Co, Cinti & N.Y."
Caption: Trouncing a terrible tough : a gentle German athlete breaks the hand of "Rattlesnake Pete."